A great deal of the universe does not need any explanation. Elephants, for instance. Once molecules have learnt to compete and to create other molecules in their own image, elephants, and things resembling elephants, will in due course be found roaming around the countryside ... Some of the things resembling elephants will be men. 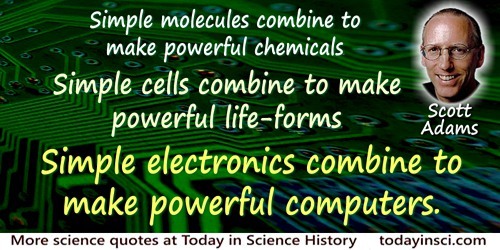 A working definition of life … could thing in terms of a large molecule made up of carbon compounds that can replicate, or make copies of itself, and metabolize food and energy…: macromolecule, metabolism, replication. Among nonclassical ions the ratio of conceptual difficulty to molecular weight reaches a maximum with the cyclopropylcarbinyl-cyclobutyl system. An anecdote is an historical molecule…. The general form of history is a fusion of anecdotes. In M.J. Hope (ed., trans. ), Novalis: His Life, Thoughts, and Works (1891), 188. An aromatic compound may be defined as a cyclic compound with a large resonance energy where all the annular atoms take part in a single conjugated system. Electronic Theory of Organic Chemistry (1949), 160. An immune system of enormous complexity is present in all vertebrate animals. When we place a population of lymphocytes from such an animal in appropriate tissue culture fluid, and when we add an antigen, the lymphocytes will produce specific antibody molecules, in the absence of any nerve cells. I find it astonishing that the immune system embodies a degree of complexity which suggests some more or less superficial though striking analogies with human language, and that this cognitive system has evolved and functions without assistance of the brain. And through the depths of space career. From 'Molecular Evolution', Nature, 8, 1873. In Lewis Campbell and William Garnett, The Life of James Clerk Maxwell (1882), 637. At your next breath each of you will probably inhale half a dozen or so of the molecules of Caesar’s last breath. 'Assault on Atoms' (Read 23 Apr 1931 at Symposium—The Changing World) Proceedings of the American Philosophical Society (1931), 70, No. 3, 219. 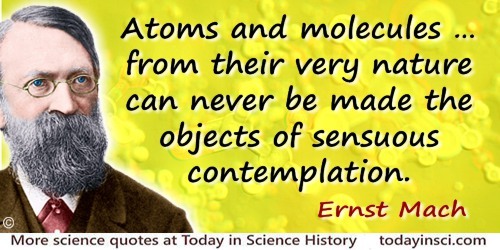 Atoms and molecules … from their very nature can never be made the objects of sensuous contemplation. In Ernst Mach and Thomas J. McCormack (trans. ), 'Space and Geometry from the Point of View of Physical Inquiry', Space and Geometry in the Light of Physiological, Psychological and Physical Inquiry (1906), 138. Originally written as an article for The Monist (1 Oct 1903), 14, No. 1, Mach believed the realm of science should include only phenomena directly observable by the senses, and rejected theories of unseeable atomic orbitals. Available energy is energy which we can direct into any desired channel. Dissipated energy is energy which we cannot lay hold of and direct at pleasure, such as the energy of the confused agitation of molecules which we call heat. Now, confusion, like the correlative term order, is not a property of material things in themselves, but only in relation to the mind which perceives them. A memorandum-book does not, provided it is neatly written, appear confused to an illiterate person, or to the owner who understands it thoroughly, but to any other person able to read it appears to be inextricably confused. Similarly the notion of dissipated energy could not occur to a being who could not turn any of the energies of nature to his own account, or to one who could trace the motion of every molecule and seize it at the right moment. It is only to a being in the intermediate stage, who can lay hold of some forms of energy while others elude his grasp, that energy appears to be passing inevitably from the available to the dissipated state. 'Diffusion', Encyclopaedia Britannica (1878). In W. D. Niven (ed. ), The Scientific Papers of James Clerk Maxwell (1890), Vol. 2, 646. Built up of carbon, hydrogen, oxygen, nitrogen, together with traces of a few other elements, yet of a complexity of structure that has hitherto resisted all attempts at complete analysis, protoplasm is at once the most enduring and the most easily destroyed of substances; its molecules are constantly breaking down to furnish the power for the manifestations of vital phenomena, and yet, through its remarkable property of assimilation, a power possessed by nothing else upon earth, it constantly builds up its substance anew from the surrounding medium. In History of the Human Body (1919), 1. Chemical biodynamics, involving as it does, the fusion of many scientific disciplines, … [played a role] in the elucidation of the carbon cycle. It can be expected to take an increasingly important place in the understanding of the dynamics of living organisms on a molecular level. 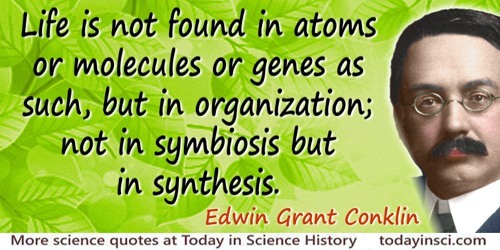 In Nobel Lecture (11 Dec 1961), 'The Path of Carbon in Photosynthesis', Nobel Lectures: Chemistry 1942-1962 (1964). Down to the molecular hexagons and carbon-chains. 'The Human Form Divine', in The Collected Poems of Kathleen Raine (1956), 86. 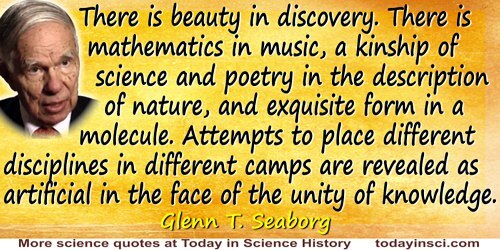 Chemistry must become the astronomy of the molecular world. Autograph Quotation for a Charity, (1905). In G. B. Kaufman, Alfred Werner (1966), iii. Sketch of a Course of Chemical Philosophy (1858), Alembic Club Reprint (1910), 11. 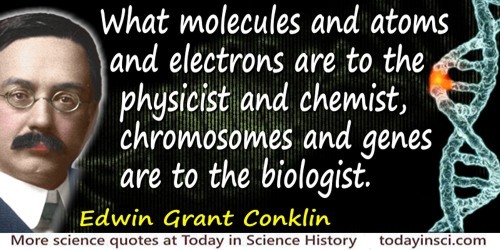 For us, an atom shall be a small, spherical, homogeneous body or an essentially indivisible, material point, whereas a molecule shall be a separate group of atoms in any number and of any nature. Annales de Chimie 1833, 52, 133. Trans. W. H. Brock. Letter to Ehrenfest (Dec 1924). Quoted in Abraham Pais, Roger Penrose, Subtle Is the Lord: The Science and the Life of Albert Einstein (2005), 432. I have lived much of my life among molecules. They are good company. I tell my students to try to know molecules, so well that when they have some question involving molecules, they can ask themselves, What would I do if I were that molecule? I tell them, Try to feel like a molecule; and if you work hard, who knows? Some day you may get to feel like a big molecule! Nobel banquet speech (10 Dec 1967). In Ragnar Granit (ed. ), Les Prix Nobel en 1967 (1968). I have paid special attention to those Properties of the Positive Rays which seem to throw light on the problems of the structure of molecules and atoms and the question of chemical combination … I am convinced that as yet we are only at the beginning of the harvest of results which will elucidate the process of chemical combination, and thus bridge over the most serious gap which now exists between Physics and Chemistry. Rays of Positive Electricity and their Application to Chemical Analyses (1921), v.
I would ... change the accepted rule that the nature of a complex molecule is determined by the nature, quantity, and position of its elementary component parts, by the following statement: the chemical nature of a complex molecule is determined by the nature of its elementary component parts, their quantity and chemical structure. 'On the Chemical Structure of Substances' 1861. If it be urged that the action of the potato is chemical and mechanical only, and that it is due to the chemical and mechanical effects of light and heat, the answer would seem to lie in an enquiry whether every sensation is not chemical and mechanical in its operation? Whether those things which we deem most purely spiritual are anything but disturbances of equilibrium in an infinite series of levers, beginning with those that are too small for microscopic detection, and going up to the human arm and the appliances which it makes use of? Whether there be not a molecular action of thought, whence a dynamical theory of the passions shall be deducible? In Erewhon, Or, Over the Range (1872), 192. If molecules can be structurally identical and yet possess dissimilar properties, this can be explained only on the ground that the difference is due to a different arrangement of the atoms in space. In Annalen der Chemie (1873), 166, 47, translated in A. Ihde, The Development of Modern Chemistry (1964), 326. If the actual order of the bases on one of the pair of chains were given, one could write down the exact order of the bases on the other one, because of the specific pairing. Thus one chain is, as it were, the complement of the other, and it is this feature which suggests how the deoxyribonucleic acid molecule might duplicate itself. In 'Genetic Implications of the Structure of Deoxyribonucleic Acid', Nature (1958), 171, 965-966. God Does Exist (2005), 45. It may be argued that to know one kind of beetle is to know them all. But a species is not like a molecule in a cloud of molecules—it is a unique population. In 'Edward O. Wilson: The Biological Diversity Crisis: A Challenge to Science', Issues in Science and Technology (Fall 1985), 2, No. 1, 22. 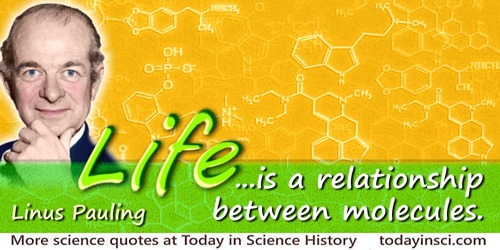 Life ... is a relationship between molecules. Quoted In T. Hager, Force of Nature: The Life of Linus Pauling (1997), 542. Life is water, dancing to the tune of solids. From Perspect. Biol. Med. (1971), 12, 239. As cited by John G Watterson, 'The Wave-Cluster Model of Water-Protein Interactions',in David G Green, Complex Systems: From Biology to Computation (1993), 36. Also quoted as "Life is water, dancing to the tune of macro molecules," by Gerald H. Pollack and Ivan L. Cameron, in Water and the Cell (2006), viii. Man, the molecule of society, is the subject of social science. The Unity of Law: As exhibited in the relations of physical, social, mental and moral science (1872), 77. Natural causes, as we know, are at work, which tend to modify, if they do not at length destroy, all the arrangements and dimensions of the earth and the whole solar system. But though in the course of ages catastrophes have occurred and may yet occur in the heavens, though ancient systems may be dissolved and new systems evolved out of their ruins, the molecules [i.e. atoms] out of which these systems are built—the foundation stones of the material universe—remain unbroken and unworn. They continue to this day as they were created—perfect in number and measure and weight. Hoffmann, as a chemist-turned-poet is making the analogy of random intermolecular interactions to those of humans. From poem, 'Men and Molecules', The Metamict State (1984), 43. Cited as an epigraph in William L. Masterton and Cecile N. Hurley Chemistry: Principles and Reactions, Updated Edition (2005), 282. Once a molecule is asymmetric, its extension proceeds also in an asymmetrical sense. This concept completely eliminates the difference between natural and artificial synthesis. The advance of science has removed the last chemical hiding place for the once so highly esteemed vis vitalis. ‘Synthesen in der Zuckergruppe', Berichte der deutschen Chemischen Gesellschaft, 1894, 27, 3189. One can ask: “If I crystallize a virus to obtain a crystal consisting of the molecules that make up the virus, are those molecules lifeless or not?” … The properties of living organisms are those of aggregates of molecules. It’s very difficult to draw a line between molecules that are lifeless and molecules that are not lifeless. From interview with Neil A. Campbell, in 'Crossing the Boundaries of Science', BioScience (Dec 1986), 36, No. 11, 738. One of the most striking evidences of the reliability of the organic chemist's methods of determining molecular structure is the fact that he has never been able to derive satisfactory structures for supposed molecules which are in fact nonexistent. Physical Organic Chemistry; Reaction Rates, Equilibria, and Mechanisms (1940),38. One reason which has led the organic chemist to avert his mind from the problems of Biochemistry is the obsession that the really significant happenings in the animal body are concerned in the main with substances of such high molecular weight and consequent vagueness of molecular structure as to make their reactions impossible of study by his available and accurate methods. There remains, I find, pretty widely spread, the feeling—due to earlier biological teaching—that, apart from substances which are obviously excreta, all the simpler products which can be found in cells or tissues are as a class mere objects, already too remote from the fundamental biochemical events to have much significance. 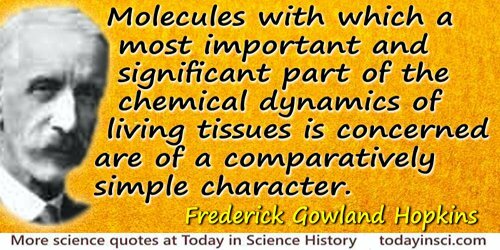 So far from this being the case, recent progress points in the clearest way to the fact that the molecules with which a most important and significant part of the chemical dynamics of living tissues is concerned are of a comparatively simple character. In 'The Dynamic Side of Biochemistry', Address (11 Sep 1913) in Report on the 83rd Meeting of the British Association for the Advancement of Science (1914), 657-8. Physicist Isador Isaac Rabi, who won a Nobel Prize for inventing a technique that permitted scientists to probe the structure of atoms and molecules in the 1930s, attributed his success to the way his mother used to greet him when he came home from school each day. “Did you ask any good questions today, Isaac?” she would say. Thomas J. Peters, Liberation Management: Necessary Disorganization for the Nanosecond Nineties (1992). Recently, we’ve reported that we have made all five bases, the compounds that spell out the instructions for all life and are a part of the nucleic acids, RNA and DNA. Not only did we make all five bases but we found them in a meteorite! So that these two things coming together really assure us that the molecules necessary for life can be found in the absence of life. This was the biggest stumbling block. In Space World (1985), 5, 25. Since many cases are known in which the specificities of antigens and enzymes appear to bear a direct relation to gene specificities, it seems reasonable to suppose that the gene’s primary and possibly sole function is in directing the final configurations of protein molecules. Assuming that each specific protein of the organism has its unique configuration copied from that of a gene, it follows that every enzyme whose specificity depends on a protein should be subject to modification or inactivation through gene mutation. This would, of course, mean that the reaction normally catalyzed by the enzyme in question would either have its rate or products modified or be blocked entirely. Such a view does not mean that genes directly “make” proteins. Regardless of precisely how proteins are synthesized, and from what component parts, these parts must themselves be synthesized by reactions which are enzymatically catalyzed and which in turn depend on the functioning of many genes. Thus in the synthesis of a single protein molecule, probably at least several hundred different genes contribute. But the final molecule corresponds to only one of them and this is the gene we visualize as being in primary control. In 'Genetics and Metabolism in Neurospora', Physiological Reviews, 1945, 25, 660. Suppose we divide the space into little volume elements. If we have black and white molecules, how many ways could we distribute them among the volume elements so that white is on one side and black is on the other? On the other hand, how many ways could we distribute them with no restriction on which goes where? Clearly, there are many more ways to arrange them in the latter case. We measure “disorder” by the number of ways that the insides can be arranged, so that from the outside it looks the same. The logarithm of that number of ways is the entropy. The number of ways in the separated case is less, so the entropy is less, or the “disorder” is less. In 'Order And Entropy', The Feynman Lectures on Physics (1964), 46-7. That Brobdingnagian molecule, tobacco mosaic virus. In 'Synthesis', in A. Todd (ed. ), Perspectives in Organic Chemistry (1956), 175. In 'Introduction', The Astonishing Hypothesis: The Scientific Search for Soul (1994), 3. The elements of the living body have the chemical peculiarity of forming with each other most numerous combinations and very large molecules, consisting of five, six or even seven different elements. In discourse (10 Dec 1893) to General Meeting, Nassau Association for Natural Science, Wiesbaden, Germany. Printed in 'The Distribution of the Organic Elements', The Chemical News and Journal of Industrial Science (1895), 71, No. 1832, 19. The fertilized ovum of a mouse and a whale look much alike, but differences quickly show up in the course of their development. If we could study their molecules with the naked eyes, we would see the differences from the start. Epigraph in Isaac Asimov’s Book of Science and Nature Quotations (1988), 73. 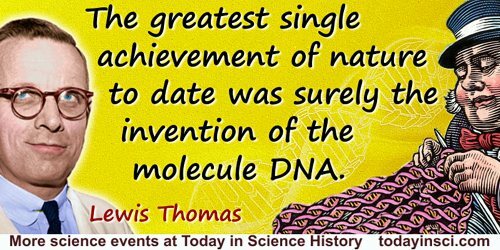 The greatest single achievement of nature to date was surely the invention of the molecule DNA. 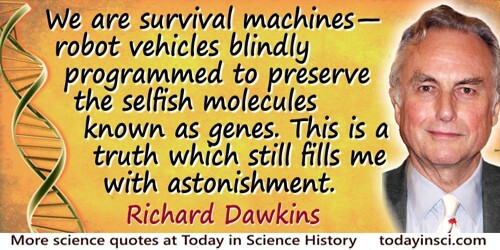 The human brain is a machine which alone accounts for all our actions, our most private thoughts, our beliefs. ... To choose a spouse, a job, a religious creed—or even choose to rob a bank—is the peak of a causal chain that runs back to the origin of life and down to the nature of atoms and molecules. The Mind Machine (1998), 145. In Vinoth Ramachandra, Subverting Global Myths: Theology and the Public Issues Shaping our World (2008), 179. The ingenuity and effective logic that enabled chemists to determine complex molecular structures from the number of isomers, the reactivity of the molecule and of its fragments, the freezing point, the empirical formula, the molecular weight, etc., is one of the outstanding triumphs of the human mind. 'Trends in Chemistry', Chemical Engineering News, 7 Jan 1963, 5. The most stable arrangement for an assemblage of molecules is one in which the component atoms and groups are packed together so that (a) the distances between neighbors are close to the equilibrium distance, (b) each atom or group has as many close neighbors as possible, and (c) there are no large unoccupied regions. In other words, each structure tends to be as 'close-packed' as possible, consistent with the 'sizes' of its component atoms or groups. 'The Structure of Fibrous Proteins', Chemical Reviews (1943), 32, 198. The separate atoms of a molecule are not connected all with all, or all with one, but, on the contrary, each one is connected only with one or with a few neighbouring atoms, just as in a chain link is connected with link. 'The Scientific Aims and Achievements of Chemistry', Nature (1878), 18, 212. The stars are laboratories in which the evolution of matter proceeds in the direction of large molecules. In Teilhard de Chardin and Bernard Wall (trans. ), The Phenomenon of Man (1959, 2008), 50. Originally published in French as Le Phénomene Humain (1955). To be born, to live and to die is merely to change forms... And what does one form matter any more than another?... Each form has its own sort of happiness and unhappiness. From the elephant down to the flea... from the flea down to the sensitive and living molecule which is the origin of all, there is not a speck in the whole of nature that does not feel pain or pleasure. D'Alembert's Dream (1769), in Rameau's Nephew and D' Alembert's Dream, trans. Leonard Tancock (Penguin edition 1966), 182. We are just beginning to understand how molecular reaction systems have found a way to “organize themselves”. We know that processes of this nature ultimately led to the life cycle, and that (for the time being?) Man with his central nervous system, i.e. his memory, his mind, and his soul, stands at the end of this development and feels compelled to understand this development. For this purpose he must penetrate into the smallest units of time and space, which also requires new ideas to make these familiar concepts from physics of service in understanding what has, right into our century, appeared to be beyond the confines of space and time. Answering “Where Now?” as the conclusion of his Nobel Lecture (11 Dec 1967) on 'Immeasurably Fast Reactions', published in Nobel Lectures, Chemistry 1963-1970 (1972). We define thermodynamics ... as the investigation of the dynamical and thermal properties of bodies, deduced entirely from the first and second law of thermodynamics, without speculation as to the molecular constitution. 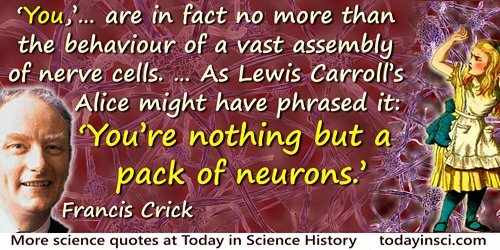 The Scientific Papers of James Clerk Maxwell (2003), 664-665. 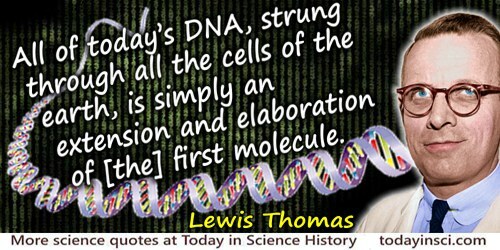 We have come a long way on that old molecule [DNA]. In The Medusa and the Snail: More Notes of a Biology Watcher (1974, 1979), 28. We set out, therefore, with the supposition that an organised body is not produced by a fundamental power which is guided in its operation by a definite idea, but is developed, according to blind laws of necessity, by powers which, like those of inorganic nature, are established by the very existence of matter. As the elementary materials of organic nature are not different from those of the inorganic kingdom, the source of the organic phenomena can only reside in another combination of these materials, whether it be in a peculiar mode of union of the elementary atoms to form atoms of the second order, or in the arrangement of these conglomerate molecules when forming either the separate morphological elementary parts of organisms, or an entire organism. Mikroskopische Untersuchungen über die Uebereinstimmung in der Struktur und dem Wachsthum der Thiere und Pflanzen (1839). Microscopic Researches into the Accordance in the Structure and Growth of Animals and Plants, trans. Henry Smith (1847), 190-1. We’re inquiring into the deepest nature of our constitutions: How we inherit from each other. How we can change. How our minds think. How our will is related to our thoughts. How our thoughts are related to our molecules. What is there about fire that's so lovely? ... It's perpetual motion; the thing man wanted to invent but never did. Or almost perpetual motion. ... What is fire? It's a mystery. Scientists give us gobbledegook about friction and molecules. But they don't really know. Fahrenheit 451 (1953, 1996), 115. Why can the chemist not take the requisite numbers of atoms and simply put them together? The answer is that the chemist never has atoms at his disposal, and if he had, the direct combination of the appropriate numbers of atoms would lead only to a Brobdingnagian potpourri of different kinds of molecules, having a vast array of different structures. What the chemist has at hand always consists of substances, themselves made up of molecules, containing defined numbers of atoms in ordered arrangements. Consequently, in order to synthesize anyone substance, his task is that of combining, modifying, transforming, and tailoring known substances, until the total effect of his manipulations is the conversion of one or more forms of matter into another. In 'Art and Science in the Synthesis of Organic Compounds: Retrospect and Prospect', in Maeve O'Connor (ed. ), Pointers and Pathways in Research (1963), 28. [About the mechanical properties of the molecules of a chemical substance being studied:] They could be measured, but that would have taken several months. So someone said, ‘Let’s get Teller in and make him guess the data.’ We got him into a room and locked the door, so no one else could get at him, and he asked questions and did some figuring at the blackboard. He got the answers in about two hours, not entirely accurately, of course, but—as we found out when we got around to verifying them—close enough for the purpose. Recalls the first time she was ever really awed by mental abilities of Edward Teller. She had joined the Manhattan Project, and needed data on the physical properties of molecules of a certain substance to get started on her assigned task of calculating its chemical properties. As quoted in Robert Coughlan, 'Dr. Edward Teller’s Magnificent Obsession', Life (6 Sep 1954), 61. [Molecular biology] is concerned particularly with the forms of biological molecules and with the evolution, exploitation and ramification of these forms in the ascent to higher and higher levels of organisation. Molecular biology is predominantly three-dimensional and structural—which does not mean, however, that it is merely a refinement of morphology. It must at the same time inquire into genesis and function. From Harvey lecture (1951). As cited by John Law in 'The Case of X-ray Protein Crystallography', collected in Gerard Lemaine (ed. ), Perspectives on the Emergence of Scientific Disciplines, 1976, 141. [To elucidate using models] the different combining powers in elementary atoms, I … select my illustrations from that most delightful of games, croquet. Let the croquet balls represent our atoms, and let us distinguish the atoms of different elements by different colours. The white balls are hydrogen, the green ones chlorine atoms; the atoms of fiery oxygen are red, those of nitrogen, blue; the carbon atoms, lastly, are naturally represented by black balls. But we have, in addition, exhibit the different combining powers of these atoms … by screwing into the balls a number of metallic arms (tubes and pins), which correspond respectively to the combining powers of the atoms represented … to join the balls … in imitation of the atomic edifices represented. Paper presented at the Friday Discourse of the the Royal Institution (7 Apr 1865). 'On the Combining Power of Atoms', Proceedings of the Royal Institution (1865), 4, No. 42, 416. … I became captivated by the edifices chemists had raised through experiment and imagination—but still I had a lurking question. Would it not be better if one could really “see” whether molecules as complicated as the sterols, or strychnine were just as experiment suggested? (11 Dec 1964) The X-ray analysis of complicated molecules, Nobel Lecture.